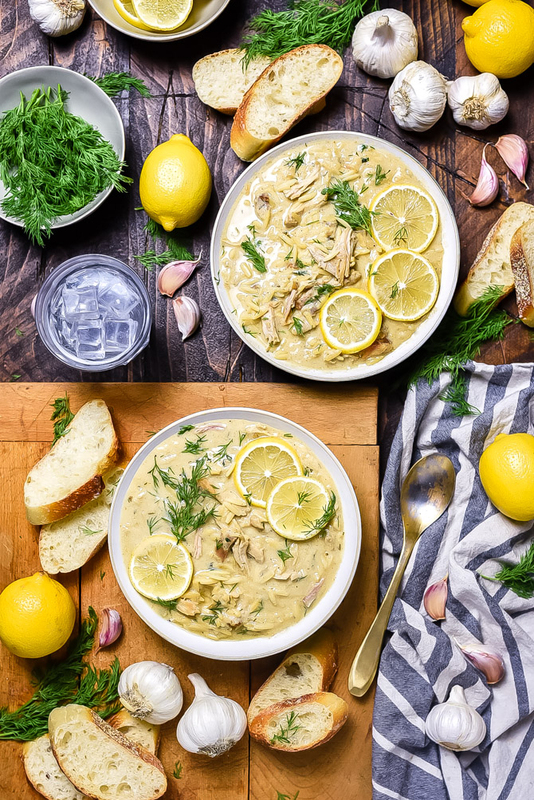 Lemon Garlic Chicken Orzo Soup. 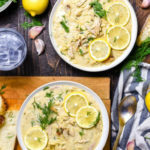 Inspired by Greek “Avgolemono”, this recipe is thickened with a mixture of lemon juice, pureed garlic, and egg to create a flavor-packed, citrusy, velvety soup. 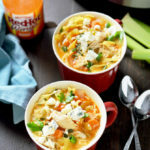 Let me start by saying that the idea for this recipe is not anywhere near “inspired” enough to warrant a blog post intro– there was no dream-like vision or whimsical trip to Greece– but here I am nonetheless, admitting to you that the urge to create a lemony chicken soup was set in motion by… a cough drop. A whole lot of congestion thanks to a head cold that just won’t quit, and a lemon-flavored cough drop. Oh, and a bowl of chicken noodle soup, the quintessential home remedy. I’m not going to say that I LIKED the accidental combination of cough drop + chicken soup flavor (when you have one after the other, they sort of blend together)… but I saw promise there. Definite potential. You know, if it wasn’t cough syrupy. Don’t let this admission make you think my flavor-pairing judgment’s been clouded. 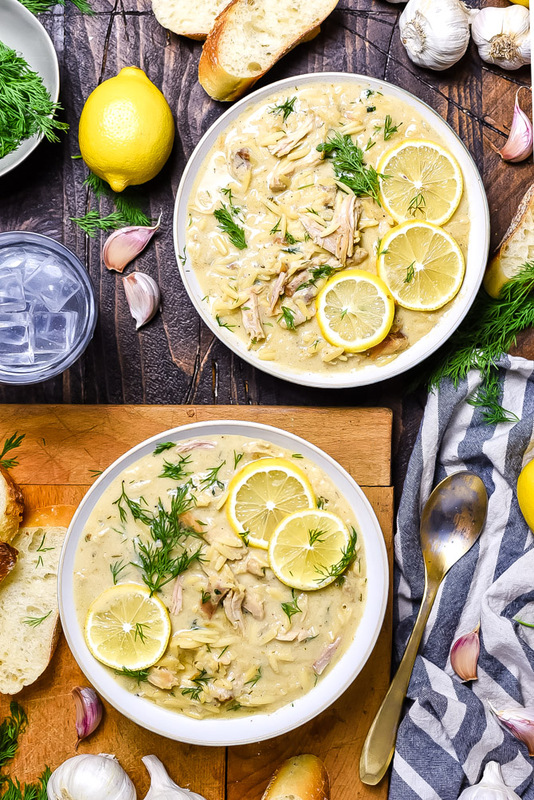 As it turns out, lemon and chicken soup is already definitely a thing– a very delicious, intensely flavorful, silky and rich thing called Avgolemono. And it’s just as popular for treating colds in Greece as chicken noodle soup is here in the US. 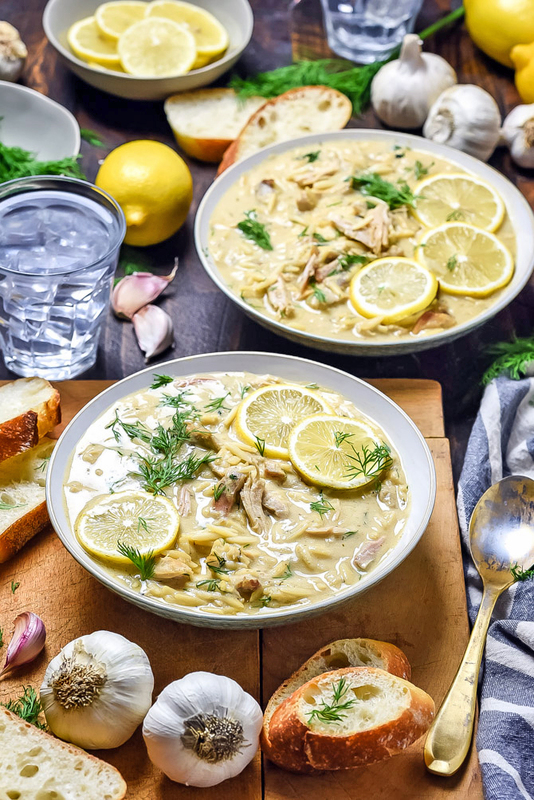 Avgolemono is actually a traditional Greek sauce consisting of chicken broth, egg, and lemon juice, which are heated together until they thicken. (Avgo is Greek for egg, and lemoni for lemon, hence the name.) It’s commonly served with vegetables, fish, or stuffed cabbage rolls, but it’s also often added to soups to give them more flavor and creaminess without having to use any cream at all. Usually Avgolemono soup requires that the sauce be added to pot containing more broth, shredded chicken, and rice. 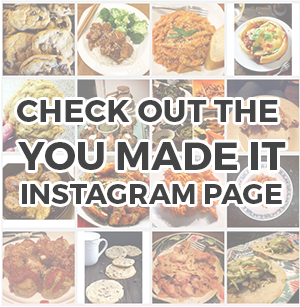 However, there are many variations– some without meat, some with meatballs, some with pasta instead of rice, and so on. 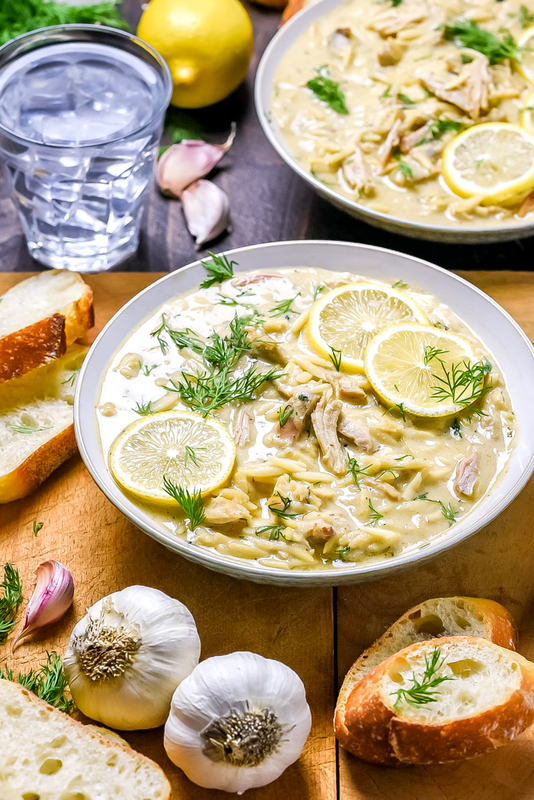 It’s very adaptable, so adapting is exactly what I did here when I made this Lemon Garlic Chicken Orzo Soup. The main difference between my version and the traditional? An absolute ton of garlic. Not 5 cloves. Not 10. TWENTY CLOVES OF GARLIC. 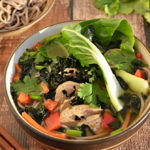 WHAT MAKES THIS SOUP GOOD FOR COLDS AND FLUS? I decided to add so much garlic because… it’s delicious? It’s garlic and I don’t need an excuse to put insane amounts of it in anything that isn’t ice cream… and even that I might be convinced to try once in my life? But also because garlic is, in itself, a great cold and flu remedy, as it contains compounds that boost immune function and help your body recover faster. Now, you might be thinking that 20 cloves of garlic is overkill here, and I hear you. But when the whole cloves are cooked in the broth, their flavor mellows and the soup that you wind up with isn’t overwhelmingly garlicky. 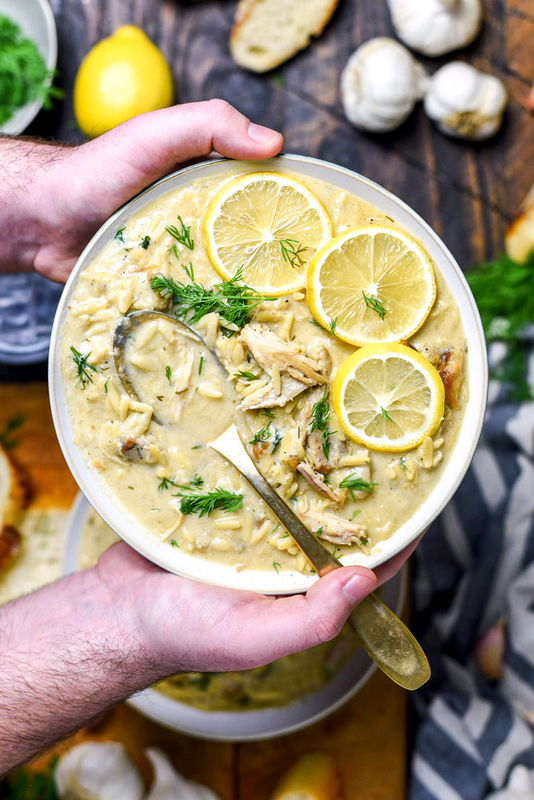 I mean, you won’t want to go around kissing anyone for a while after eating this Lemon Garlic Chicken Orzo Soup, but hey, if you’re sick anyway, you’re probably avoiding that as-is. And garlic isn’t the only cold and flu soothing element of this Lemon Garlic Chicken Orzo Soup. Lemon is high in Vitamin C and can help soothe a sore throat, and the chicken, egg and orzo (which I’ve subbed in for the more traditional choice of rice) add substance that your body needs to keep up your energy and get better. In fact, hot soup in general can reduce congestion and inflammation, and help keep you hydrated at the same time. Does it actually work? I can’t be sure. I’m beginning to feel a lot better today, but that could just be the natural course of the cold. Either way, I’m going to continue to make this soup when I’m sick AND when I’m not, because, well, it’s just really good. The first step of making Lemon Garlic Chicken Orzo Soup is preparing the chicken. I use chicken thighs here, which pack in more flavor than breasts. Once browned and cooked through, transfer them to a cutting board and set aside for later. Then it’s time to add in the garlic over low heat. You don’t want to brown the garlic, which will give it a bitter taste. 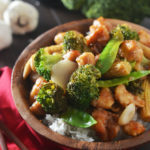 Instead, just gently cook it in the rendered chicken fat and juices until it starts to become fragrant, and then add in the chicken broth and let it simmer for 15 minutes to soften the garlic and release its flavor. A quick note about peeling the garlic– 20 cloves might seem like they’d be very time consuming to peel, but all you have to do is crush a head of garlic with your palm, pick out the cloves, and throw them into a large, sealable plastic container. Place the top on and shake the container vigorously for a few minutes (it’s a workout) and your garlic will peel itself. Or, of course, you can just do it by hand. The key to making Lemon Garlic Chicken Orzo Soup is to not curdle the egg, which we prevent by slowly streaming hot broth into the egg mixture to temper the eggs before adding them back to the soup. The bonus is that we’re able to puree the garlic as well at this stage, making it a part of the Avgolemono mixture that will thicken the soup. Another element that helps to thicken the soup is the starches from the orzo, so cook the orzo directly in the chicken broth. Then add the lemon-egg-garlic mixture back to the pot and cook until it just begins to thicken. Finally, it’s time to add back the chicken and season with salt, pepper, and fresh dill. Continue to cook and stir until heated through, and then it’s ready to serve! Season the chicken all over with salt and pepper. Heat the oil in a pot over medium-high heat. Add the chicken to the pot and cook until deeply golden browned, flipping once halfway through, about 15 minutes total. Transfer the chicken to a cutting board and let cool. Reduce the heat to low. Add the garlic and shake the pan to gently cook for 3 minutes. Don’t let the garlic brown, it should just become fragrant and soften slightly. Pour in the chicken stock. Let simmer for 15 minutes. Remove the garlic from the chicken stock and add to the bowl of a blender or food processor along with the eggs and lemon juice. Process to combine. Continue to run the blender or food processor while slowly streaming in one cup of the hot stock until fully combined and smooth. Set aside. Bring the chicken stock in the pot to a boil. Add in the orzo, stir, and cook for 7 minutes. Reduce heat to low. Add the egg mixture to the soup and continue to cook over low heat until thickened, about 3 minutes. Meanwhile, shred the chicken. Add the shredded chicken back to the soup. Season with dill, salt, and pepper, to taste. Garnish with additional dill and lemon slices, if desired, and serve with crusty bread. 20 cloves of garlic?! I love it! My kind of soup and perfect for winter. This is perfect! I’ve been on an orzo kick lately and it’s so cold today, nothing better than soup! I’m sorry that you were sick, but very happy to have this recipe as a result. Looks so comforting and delicious! Yes please to the garlic! One of my favorite dishes is 40 clove chicken. 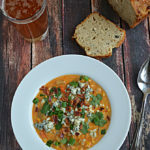 Your soup hits all the right notes for me and I can’t wait to try it. Thanks! Yummy. I would think that the lemon would lighten up the dish. Delicious flavors and hearty, my family is going to love this. This was so simple and so good. Can’t believe there is no butter or cream.